Prades, L.; Bautista, Y.; Climent, J.; Sanz, V.; Chiva, S.; Dorado, A.D.; Gamisans, X.
Biotechniques for Air Pollution Control and Bioenergy. 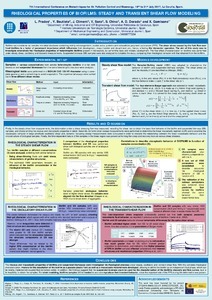 7th International Conference on Biotechniques for Air Pollution Control and Bioenergy. A Coruña. Spain, July 19-21, 2017. Prades, L., Bautista, Y., Climent, J., Sanz, V., Chiva, S., Dorado, A.D., Gamisans, X. Rheological properties of biofilms: steady and transient shear flow modeling. A: International Conference on Biotechniques for Air Pollution Control and Bioenergy. "Biotechniques for Air Pollution Control and Bioenergy. 7th International Conference on Biotechniques for Air Pollution Control and Bioenergy. A Coruña. Spain, July 19-21, 2017.". A Coruña: 2017, p. 102-104.